If you're in the mid-west of the US...it's just a few hours until 2014! Can you believe it? 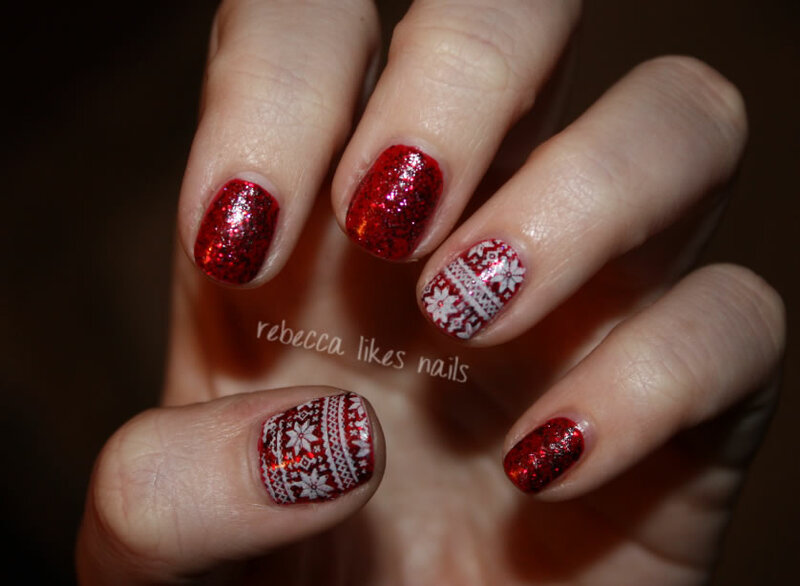 I'm finishing out the year with a post by the amazing Rebecca from Rebecca Likes Nails. 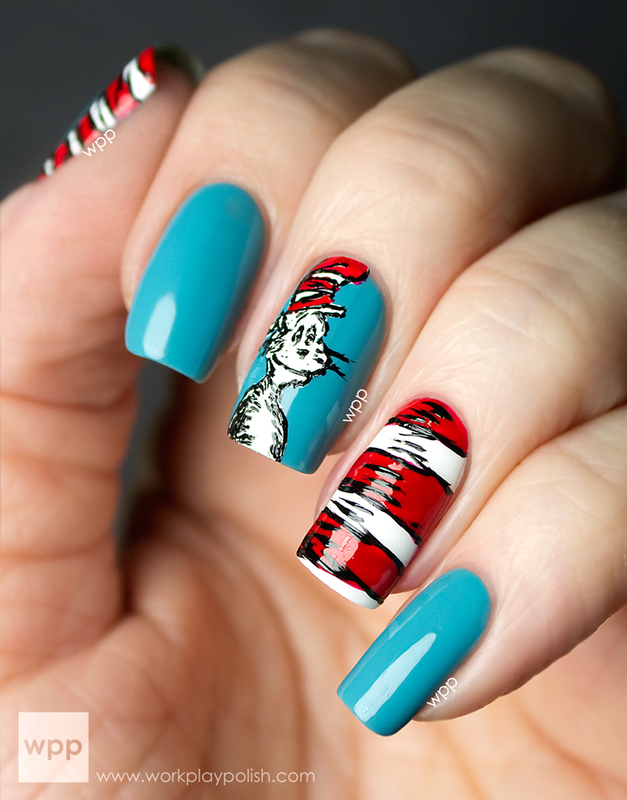 Rebecca is a veteran nail blogger, but a newfound obsession for me. 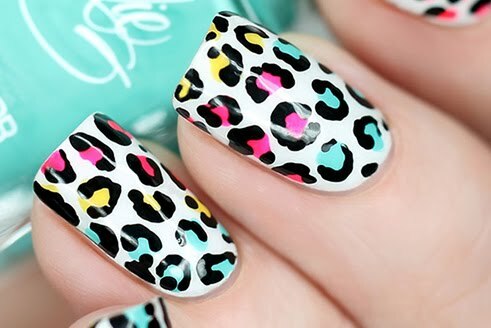 She's a licensed nail tech with beautiful pictures, an enviable variety of polishes, and genius-cute nail art. I'm looking forward to getting to know her. Thank you, Rebecca, for agreeing to contribute to this series based on a simple introduction! You rock! I'll be donating $10 to the Polished Girlz on Rebecca's behalf. If this is the first post you've read in the WPP "Blogging for a Cause" Guest Post Series...pop over to the intro post here to see what an amazing organization each of these bloggers are supporting with their participation. Hello to the lovely readers of work/play/polish! If you don't know me already, I'm Rebecca from Rebecca Likes Nails. I've been blogging for three years now and this is the first time I have ever seen a blogger take so much initiative to help out such an amazing cause. Leslie is one of the busiest and most productive people I've had the pleasure of working with... It's crazy! I don't know how she does it. Thank you Leslie for asking me to be a part of this fantastic series. As someone who is often hospitalized myself, I can't imagine the joy The Polished Girlz must bring to the young girls going through such difficult times in their lives. Something as simple as nail polish can truly brighten a day, and that means the world to anyone struggling through an illness or disability. I am so proud of all the people involved with this organization! It just so happened I was wearing a holiday manicure when Leslie approached me about this collaboration post, so here is that manicure! 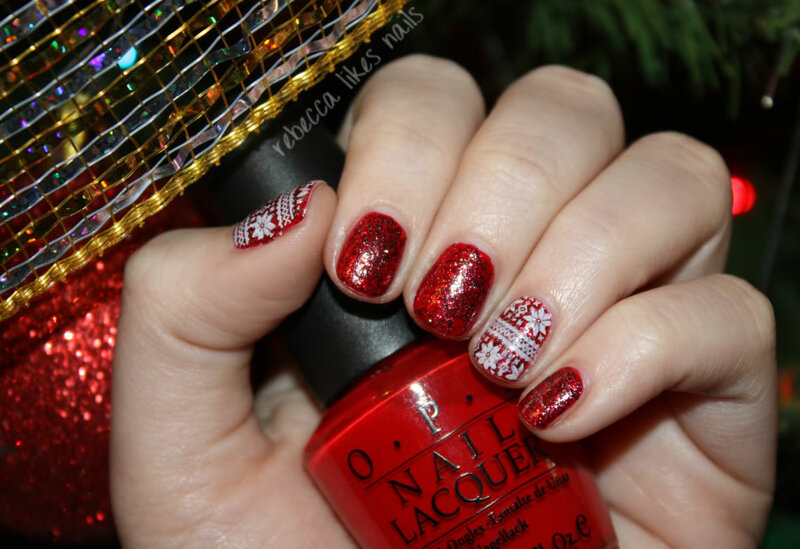 This holiday manicure started with a holiday polish! My favorite red, OPI - Comet Loves Cupid. How can you not use that polish for Christmas? 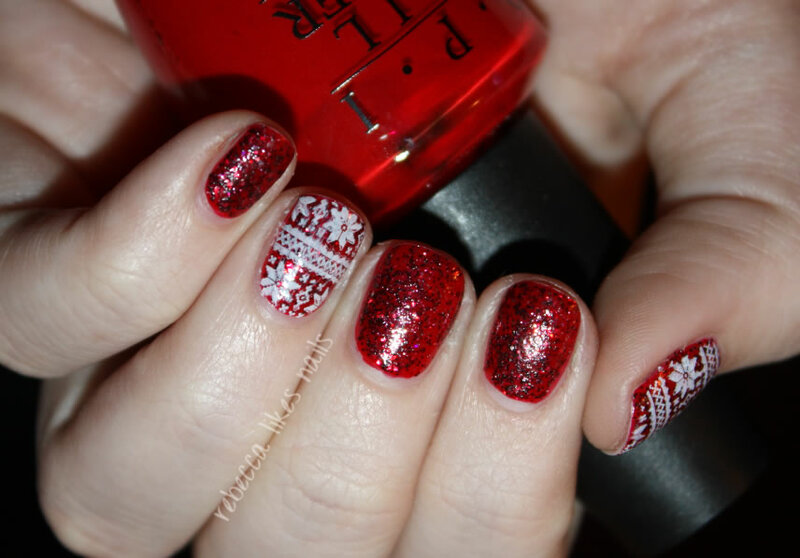 I added two festive red glitters on top - Cindy and Eva from Shimmer Polish. Once that was dry, I added a little stamping for some extra holiday cheer. This knit-sweater pattern comes from Winstonia plate W120. I stamped using white special polish from Konad. 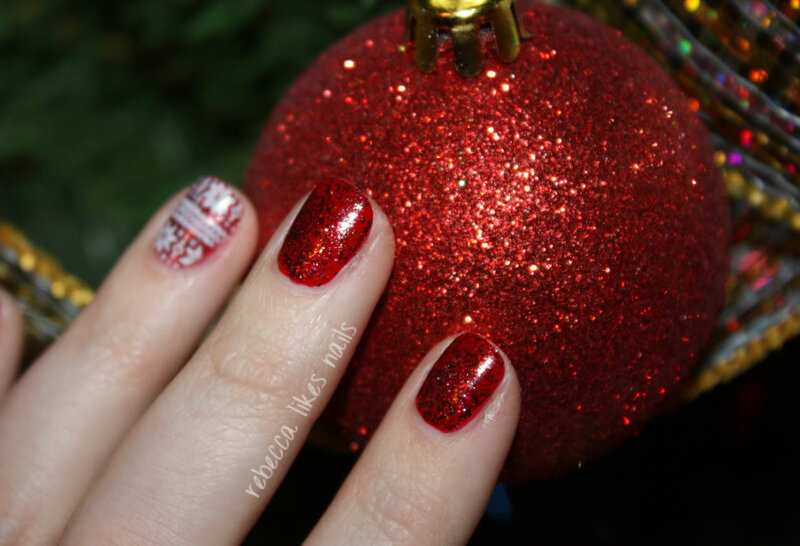 Don't these nails look great with my sparkly red ornaments? 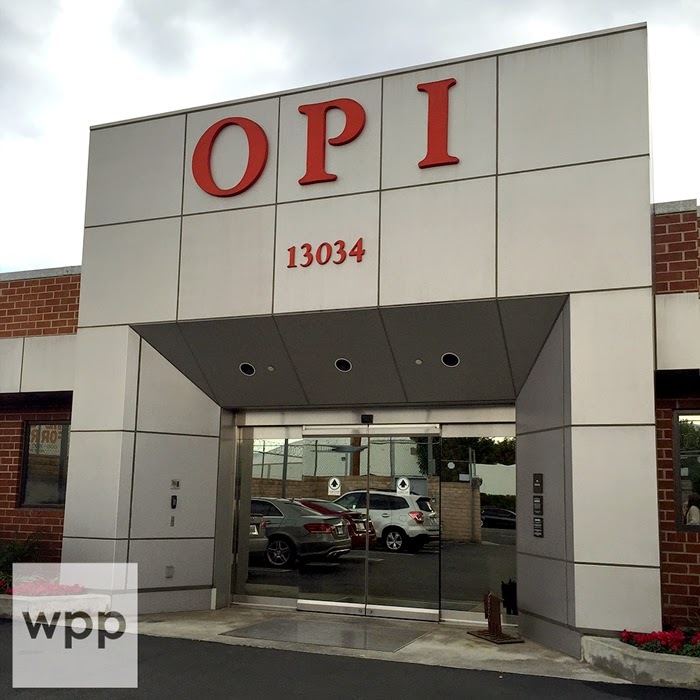 Thanks again Leslie for all your amazing work on this project! And Happy Holidays everyone! Get to know Rebecca Likes Nails!